Academic Status: Previous is 1st year, Class 1. Actually is 2st year, Class 1. School: Hakoniwa Academy. Previously is Hakobune Middle School. Age: 15-16 ( Zodiac: Leo) Blood Type: AB Mentality:: Zero. Previous is Normal. Affiliation: Zenkichi's Student Council. Previous is Medaka's Student Council and True Flask Plan Position: President. 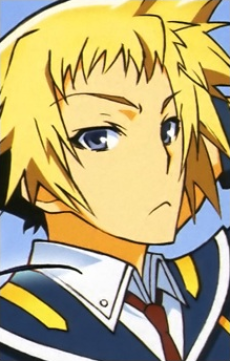 Previous is General Affairs Manager The male protagonist, childhood friend of Medaka, and the Student Council General Affairs Manager, reluctantly joining for the sake of protecting Medaka; in the pilot chapter, Medaka assigns him to become the Vice President. Zenkichi always shows enthusiasm toward Medaka’s cause for helping others and will punish anyone who opposes that cause. It is later revealed that he is the one who reformed Medaka into her current personality. It is implied he has feelings for her. Little is known about Zenkichi's past except that he has been with Medaka since they were two years old. The relationship between Shiranui and Zenkichi is frequently commented on by their classmates, often negatively, on how they interact with each other. Shiranui has commented that she is only friends with him when she is in the mood. Ironically, Shiranui's grandfather notes that Zenkichi is probably the only person who can get along with Shiranui. Zenkichi eventually reveals his feelings directly to Medaka before sacrificing himself to destroy Kumagawa. Zenkichi is noted to be a "normal" individual, one with no special abilities. Medaka's brother, Maguro, takes special interest in him because no matter how much he's discouraged or fails, he stands back up. Zenkichi has vowed to protect Medaka ever since she was emotionally scarred after failing to help a classmate in middle school. In order to become stronger, he has undertaken Maguro's hellish training sessions along with Medaka. Zenkichi is revealed to be a master of Savate, having honed his skill to such an extent that he possesses an almost impenetrable defense. According to Zenkichi, he learned this style because he fears fighting and uses it to disarm opponents and take away their desire to fight. He also studied on how to disassemble guns, and rocket launchers, just in case something ever happened to Medaka. Thanks to this display of skill, the Flask Plan is very interested in him, believing him to have the potential to become an Abnormal. However, it has been repeated iterated that Zenkichi, despite his remarkable abilities, is still only "normal." If standard human limits are applied though, Zenkichi has long since passed the line of a "normal"; for instance, when he caused a small earthquake with his stomp. Even if it was biologically possible, a man of Zenkichi's weight and mass would find it impossible. Ten years later, Zenkichi and Tsurubami return to Hakoniwa to reunite with their friends on the tenth anniversary of Ajimu's disappearance. Running late, they barge into the Student Council office, and on the women changing. They are beaten up for their transgression. Chastised by Akune, Zenkichi states he still feels young at twenty-six. At Kikaijima's request, Zenkichi holds her baby, and asks for the child's name. He and the others discuss Nabeshima's Olympic career, the medical advances happening at the rebuilt Hakoniwa General Hospital, and the successes of the committee chairs. He asks Naze what she has been up to, and is surprised to hear from Wanizuka that Munakata is now a demon hunter. He is surprised to see that Shiranui has not changed at all, but is happy to hear what she and Emukae have been up to. Probed by the others, he reveals he has spent the past four years working to join the Kurokami Group. At Akune's urging, he heads to Medaka's office, to find her sleeping with a large group of dogs. Zenkichi greets Medaka, trying tell her how beautiful she has become, but is interrupted by her dogs. He thinks to himself that Medaka has become docile, and that even The End, and all the skills Medaka learned with it, have faded away. Zenkichi thinks that the loss of their skills happened to everyone, and remembers that he did not lose his own skills until he was twenty-two. He is surprised to hear about Medaka's "Moonsault Plan", a project to restore the moon. Hearing that she is restoring the moon in part to show Ajimu and Kumagawa that she is still well, Zenkichi wonders if the two are really still alive. Medaka reassures Zenkichi that both are alive, and shows him their messages from the 100 Flowers Run. Zenkichi is aghast to see she has been storing her hundred messages in the suggestion box, but in a moment of nostalgia notes that everything started with it. Zenkichi reminds Medaka that the reconstruction of the moon will take several years, and challenges her to a duel, with the condition that she marry him if he wins. Medaka accepts, telling him that if she wins, he will have to marry her; Zenkichi thinks to himself that their conditions are the same. Zenkichi notes that this is their first battle with no gimmicks involved, then excitedly charges Medaka.